What precedents are appropriate models for a local and regional public transportation system in Detroit and the surrounding cities? What public transportation infrastructure does Detroit currently have? What works about it? What does not work? What public transportation systems are currently being planned for the city and the region? How will what is being planned affect the city and region? What modes of public transportation would be appropriate for Detroit? In order to have a truly effective system, how far would the system reach and what form should the transit system take in connecting suburban communities to the city center? What obstacles would need to be addressed in order to make the system popular with users that do not currently consider using public transportation in Detroit? How would a public transportation system designed to encourage development in the city be designed? What are the critical factors that need to be considered to promote growth? According to the American Public Transportation Association, over the last five years, “public transportation use has risen 21 percent-faster than vehicle miles traveled on our roadways and airline passenger miles logged over the same period.” How does Detroit compete with cities that currently have established public transportation systems or cities that are rehabilitating and expanding underutilized transit systems? How would a comprehensive regional public transportation system affect the city of Detroit? 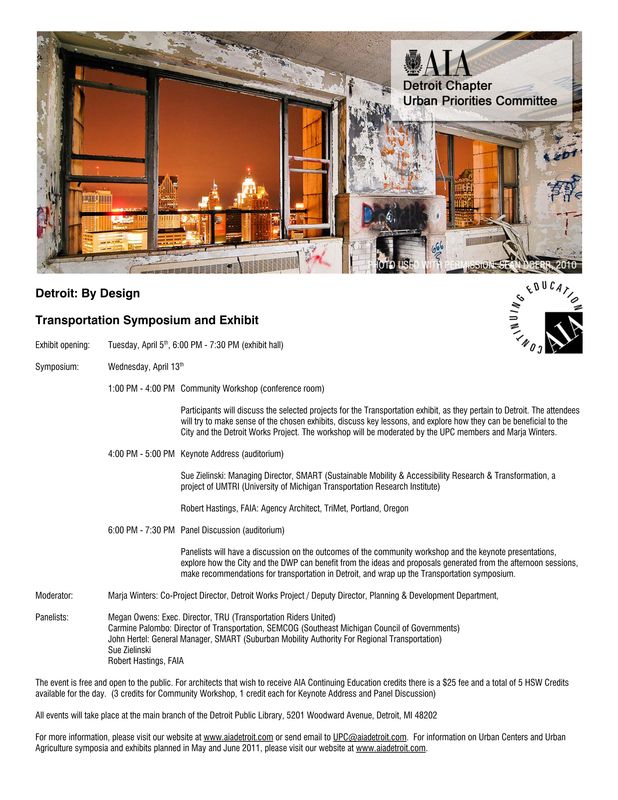 What role would architects and designers play in the development of a public transportation system in Detroit? What are the minimum levels of public transportation infrastructure required in order to affect a real change in the city/region?